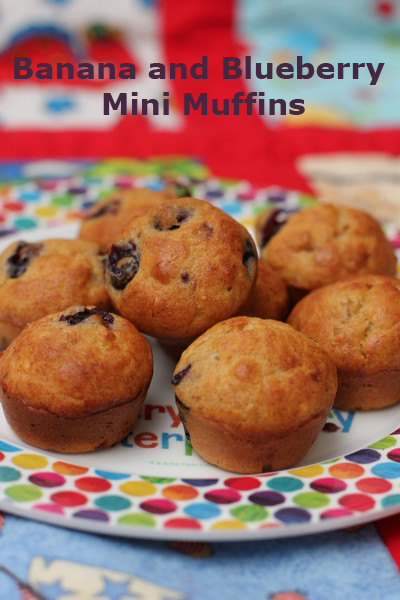 When I first decided to make some mini muffins for my bub, I didn’t want to add extra sugar (whatever was already present in fruit would be sweet enough), so I came up with an easy recipe that I am super happy with (as are the bubs and adults who have tried it). 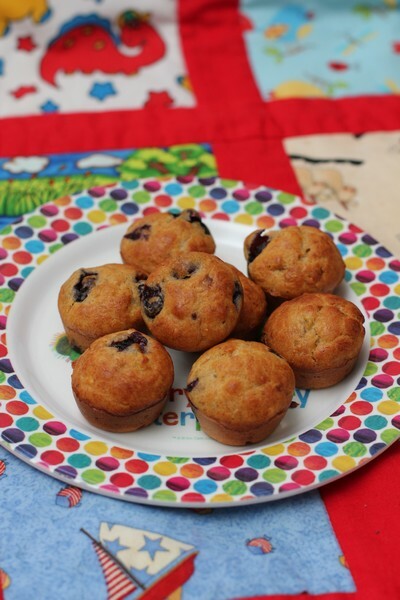 I doubt this recipe would make fantastic normal sized muffins (as I do have a sweet tooth, and find them a little on the low-sweet side), but they are perfect mini muffins. I hope you and your kids or bubs enjoy this recipe. Preheat oven to 170C. Lightly grease 16 holes of a mini muffin tin with a little oil (using a pastry brush). In a medium bowl, whisk together the egg and oil. 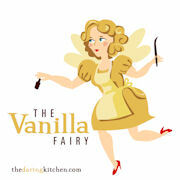 Once well mixed, add banana, vanilla and cinnamon and whisk well. 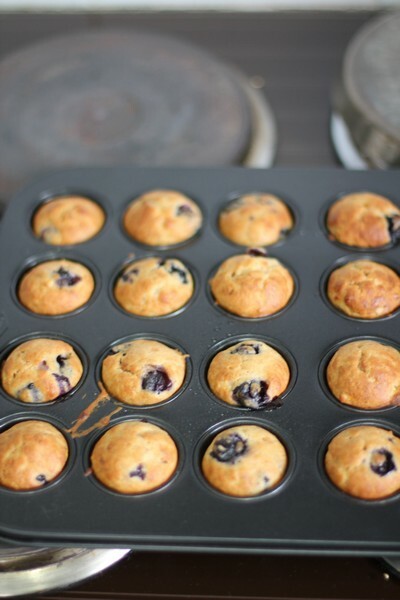 Add self-raising flour and fold through with a spatula, followed by the blueberries. Mix until just incorporated, try not to over-mix. Spoon the mixture into 16 mini muffin holes and bake for approximately 15 minutes. (check at 5 and 10 minutes to gauge how long they will take). Allow to cool slightly in the tin for a few minutes, then remove and cool on a cooling rack. Mini muffins are best eaten on the day of making, but can be kept in an airtight container for 2 days, or frozen and allowed to thaw on the day of eating. 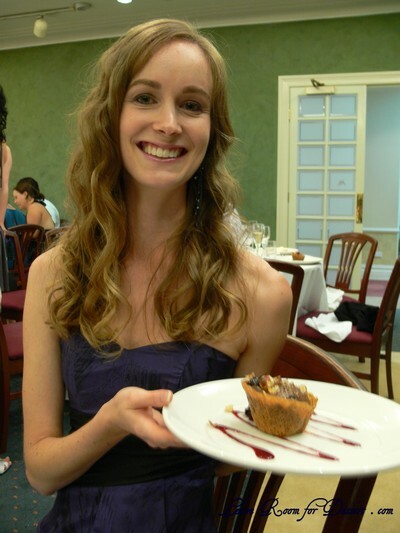 There have been many lovely dessert recipes on MasterChef this year (like most years). Some of the top chefs in Australia share some of their beautiful recipes, some which can be mastered at home, and others which are a bit more difficult to achieve at home (either due to equipment or accessibility to ingredients). 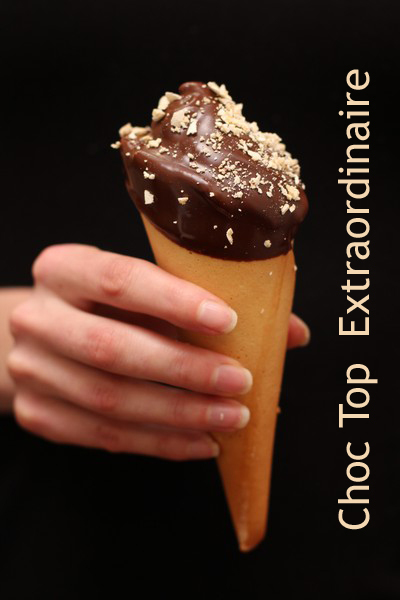 One of the recent recipes was by Nick Palumbo from Messina (an amazing gelato store and one of the best in Sydney), and it was a decadent looking choc-top. Having visited Messina many times to try both their gelato and magnificent desserts from their Creative Department, I knew this dessert was one I wanted to try. I took two days to make the components (as I needed to organise my time around my bubs naps). 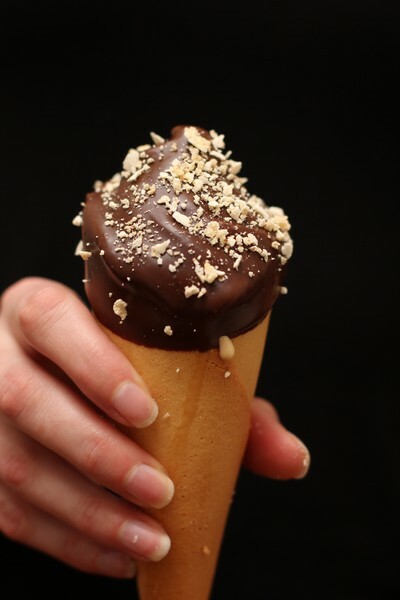 The first day I made the almond meal, hazelnut paste, amaretti and gelato base (and left it in the fridge over night before churning), the second day I made the ice cream cones, Italian meringue, ganache and chocolate dip and assembled it. My first cone didn’t turn out very well (shape-wise), which meant we got to try it! It was lovely and crunchy and a had wonderful flavour. I would love to make them again (even if they were time consuming). I think I may have also taken the caramel a little too far, as I ended up with a slight bitter taste in the gelato (although it still went well with all the other flavours. 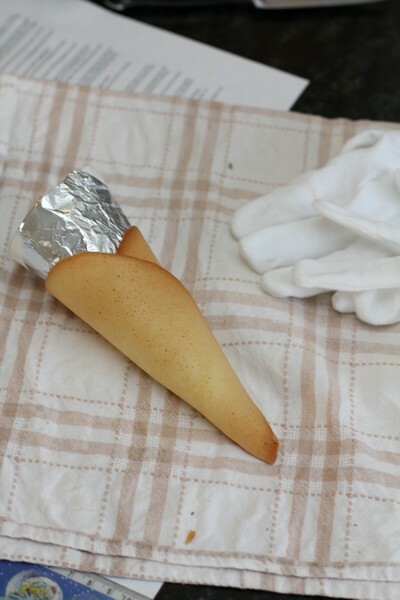 The cone that made it into the pictures, was piped (using a piping bag) and placed in the freezer for a while (maybe 20 mins?) and then dipped into the chocolate, which had cooled a little, but was still warm. The choc-tops were very lovely, quite sweet (probably not helped by the melting gelato). 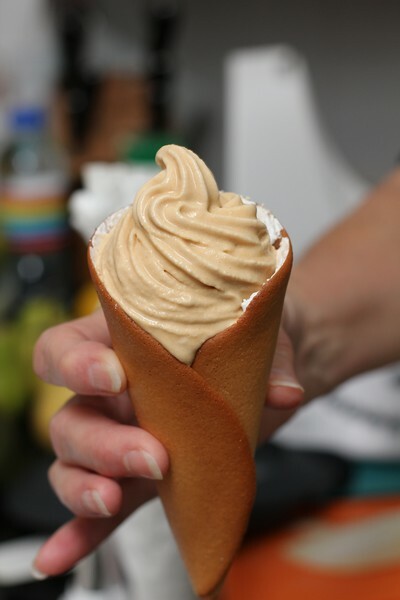 I would love to make the cone mixture again, even if just in rounds to have with ice cream. I made 1/3 of the almond meal, hazelnut paste and gelato (this base was placed in my two ice cream makers). I made half the quantity of the amaretti, ganache, chocolate dip and cones (it made 7 cones – which only used about half the gelato and even less of the biscuits). I used some cotton gloves handle the cones before setting. I made my own templates for moulding the cones. Cut an A4 piece of cardboard in half. Twist the cardboard, making the middle of one of the long edges the point of the cone. 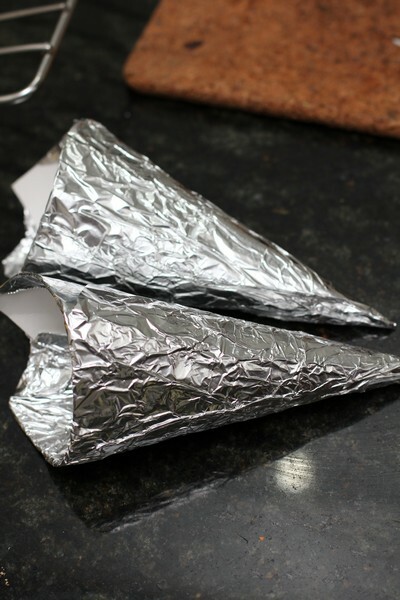 When satisfied with the shape, staple in place and then cover in foil. I found a skin formed on the top of my gelato base, as it was left in the fridge overnight (I just whisked it back in). I made the ganache and Italian meringue 3 hours before serving, and this was fine (could have even gone longer). I churned the gelato and placed it in the freezer 2 hours before serving, and it should have been in longer. 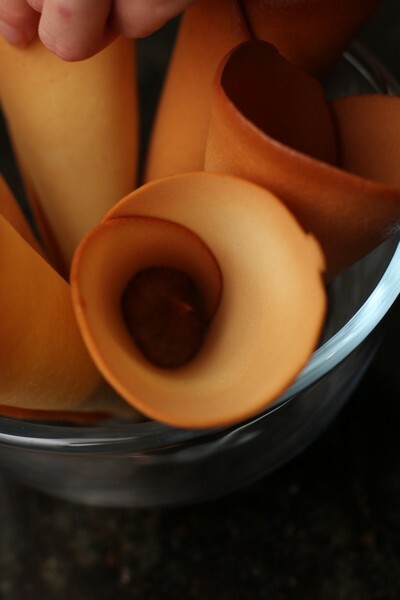 Once I piped it into the cones it was already melting, although we didn’t have time or space to leave them to set in the freezer for longer – this made dipping them in the chocolate very hard. Preheat one oven to 150C and a second oven to 195C. To make the almond meal, place almonds on a baking tray and place in the 195C oven for 8 minutes. Remove from oven and place in blast chiller to cool down. Transfer almonds to the thermomix and blend to make almond meal, being careful not to blend too much. Set aside to use in the amaretii biscuit. To make the hazelnut paste, place hazelnuts and vegetable oil in a thermomix and blend until smooth. Pass through a drum sieve into a bowl and set aside to use in the ganache and chocolate dip. To make the gelato, place milk in a 7 L saucepan, set over medium heat and heat to 40C. Place egg yolks in a bowl and whisk till pale. Place malodextrine, skim milk powders and salt in a bowl and mix until combined. Once the milk hits 40 C, add the powders and blend. Pour about ¼ of the mix slowly into the egg yolks and keep whisking. Then, pour the yolks with a ¼ mix, back into the saucepan with the rest of the mixture and bring up to 75 C. Take off the heat and let stand. In a large saucepan, place the sugar with a little water and make a slurry and put on a stove on highest heat and let sugar caramelize till you get a dark amber colour. At the same time, place the cream in a saucepan and heat to just before boiling, careful not to burn the cream. Once sugar is dark amber colour, take off heat and very slowly pour the hot cream in, being careful that it doesn’t bubble over. Once sugar and cream are combined, add to the reserved mixture. Blend with a stick blender and strain into shallow pans. Transfer to the blast chiller and cool until the mix gets to around 5 degrees. Transfer mix to the soft serve machine and set to production mode. To make the ganache, place hazelnut paste, cream, dextrose and glucose in a thermomix and heat to 80C, speed 3. Turn off thermomix and reset to 37C, speed 3. Slowly add chocolate until combined. Transfer to a shallow container and place in the fridge to cool. To make the amaretti biscuits, place egg whites, icing sugar and sugar in mixer with whisk attachment and mix until meringue forms and sugar is dissolved. Add bi carb and cream of tartar while still whisking and then add the bitter almond extract. Fold in reserved 30 grams almond meal. Transfer mixture to a piping bag and pipe small droplets the size of a 20 cent coin onto a paper lined tray. Place in the 150C oven and bake for 10 minutes, reduce oven to 110 C and continue to bake until dry and crunchy, about 40 minutes. Remove from oven and set aside. To make the Italian meringue, place sugar, glucose and enough water to make a slurry in a saucepan and set over medium heat. Heat to 121C. 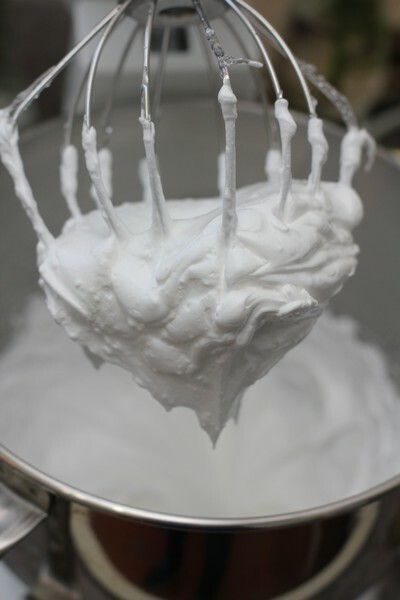 While the sugar is heating, place egg whites in the bowl of an electric mixer and whisk until firm peaks form. While the mixer is running, slowly pour in hot sugar syrup. Whisk until mixture is room temperature and thick and glossy. Transfer mixture to a piping bag and set aside in the freezer. To make the sugar cone, place egg white, sugar, milk, vanilla and salt into a food processor and blend together for a few minutes. Add flour and butter and beat until fully incorporated and batter is smooth. Lightly spray a 25cm crepe pan with a small amount of cooking spray. Pour 45gr of batter on to the cold pan and roll the pan around and tap it a little so you form what looks like a pancake about 18cm round, making sure it is even thickness all over. Place pan in a preheated oven at 195 C until a nice tan colour around edges, about 9 minutes. Take out and flip and place back in oven for another 1-2 minutes. 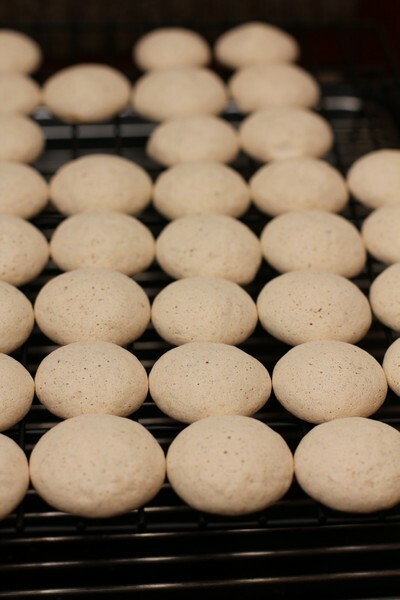 Take pan out of oven and quickly lay sugar disc onto a clean towel and top with cone roller, leaving enough of the disc sitting off the edge of the roller to allow for a pointed cone base to form. 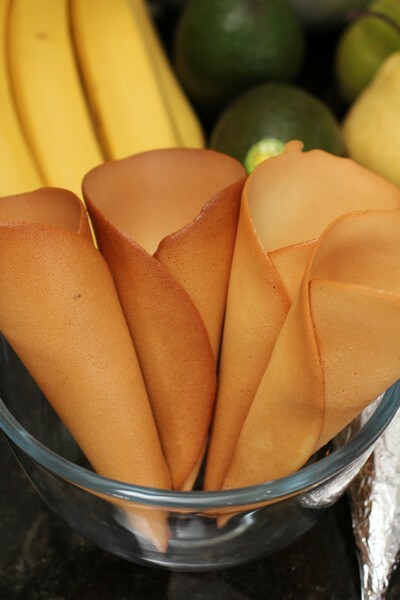 Using towel and cone roller as a guide, roll sugar disc into a cone shape with a 6cm opening. Hold seam side down for 1 to 2 minutes or until cone cools, making sure to also pinch the bottom of the cone so there is no hole at the bottom. Cool pan completely in an ice bath, wipe dry and repeat until all batter has been used. Set cones aside. To make the chocolate dip, place chocolate, hazelnut paste and cocoa butter in a thermomix and set on time 10 minutes, temperature 50, speed 4. Set aside, keeping at 50C. Transfer the ganache to a piping bag and return to the fridge. 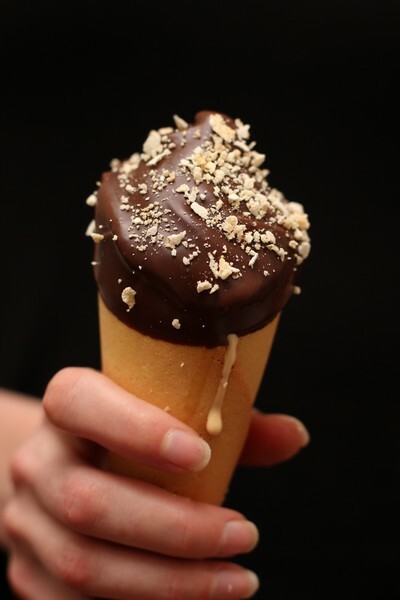 To assemble the cone, take the ganache piping bag from the fridge and pipe a little into the base of the sugar cone. 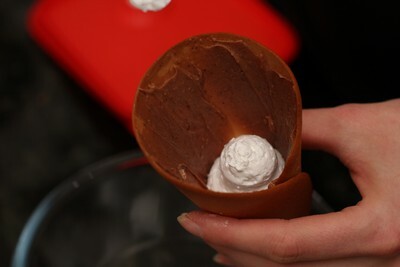 Using a small palette knife, work the ganache up the inside wall of the cone all the way up to the opening, making sure to have the same thickness lining the inside of the cone. 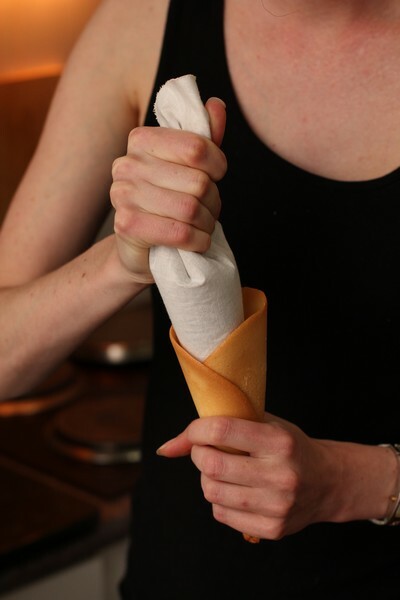 Take the Italian meringue piping bag from the freezer, cut the tip and pipe a little into the cone. Using a small palette knife, work the meringue up the inside wall of the cone all the way up to the opening, making sure to have the same thickness of meringue lining the inside of the cone. 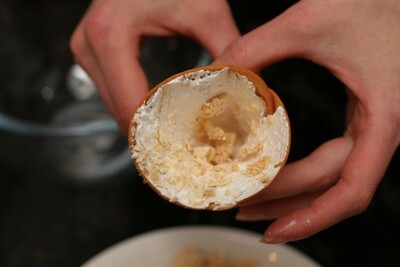 Crush amaretti biscuits finely and sprinkle inside the cone covering the meringue. Tip cone upside down to remove any excess crushed amaretti that didn’t stick to the meringue. Place the cone hard up to the gelato machine and ensure that the gelato packs firmly inside the cone. Once you have packed the cone level, slowly turn the cone around in a circular motion to achieve the classic soft serve cone. Place in the blast chiller to firm up for 1 minute. Remove gelato from blast chiller and stab the gelato with the Italian meringue piping bag and pipe in 3 lots of meringue. Stab the gelato with the ganache piping bag and pipe in 3 lots of ganache. Return the gelato to the blast chiller to firm 1-2 minutes. 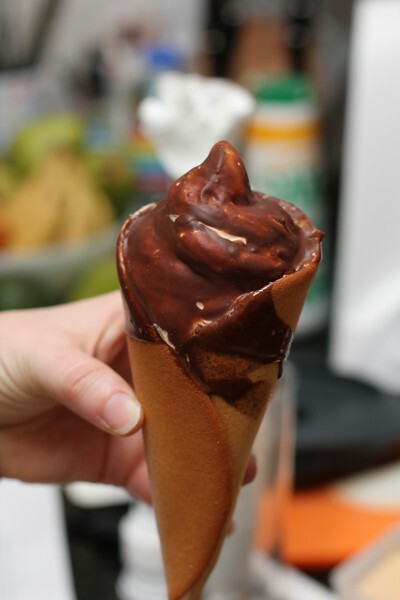 Dip the cone in the chocolate topping ensuring that you cover the gelato and at least 2 cm of cone as well, ensure it doesn’t run down the cone by keeping it on an angle. Sieve crushed amaretti biscuit and sprinkle the gelato with larger pieces of crushed amaretti biscuit.